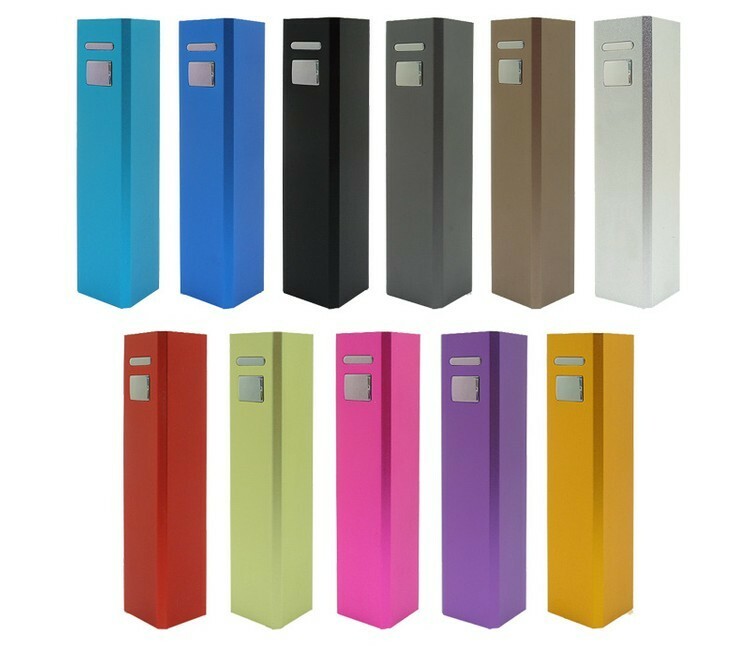 No need to search for a power outlet with the SolarBar - charge your battery while having fun in the sun. 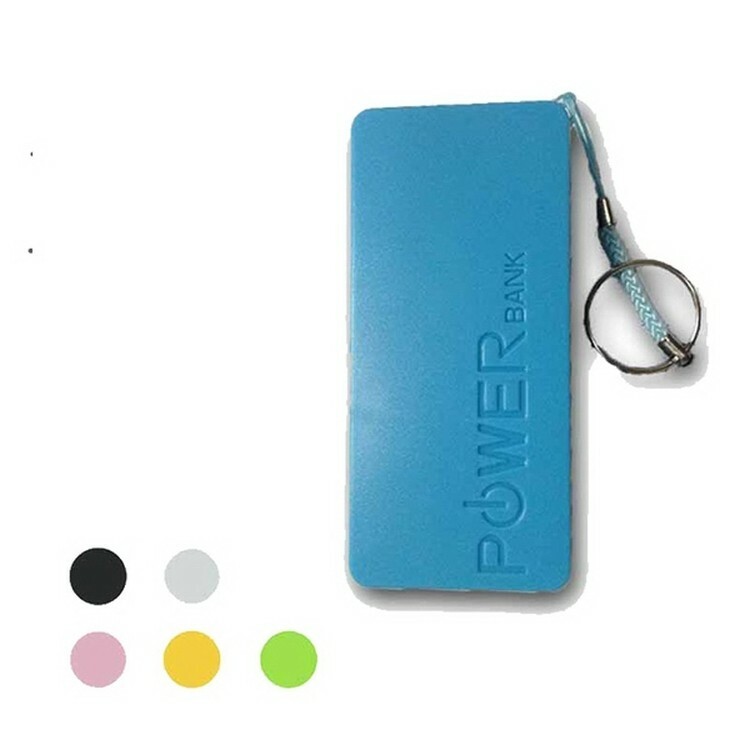 Ideal for everyday use, this power bank will keep you going whether you’re in between meetings or need a battery back-up while hiking in the mountains. The new Color Expressions 4 color process is designed to make your message stand out from the crowd! 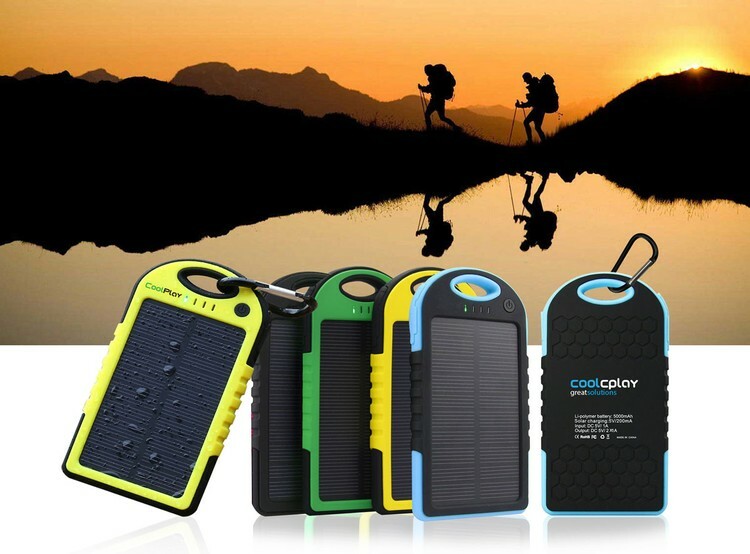 Slim & lightweight design Battery capacity: 3,000mAh High efficiency Solar Panel - 5.0V/130mA Charge the internal battery by: - solar energy: 45-50 hours - computer: 4-5 hours Blue indicator will illuminate when SolarBar is charging via solar panel. 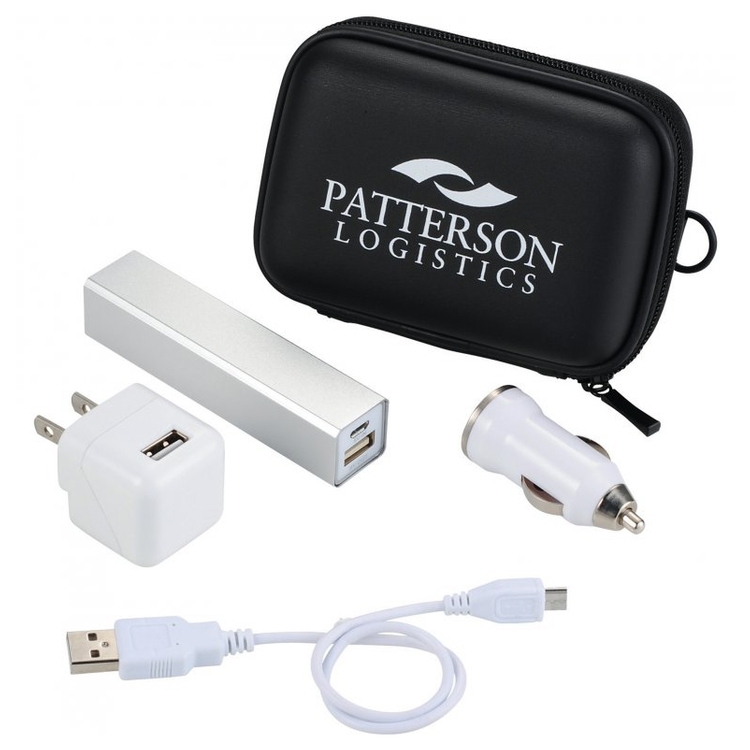 Compatible with mobile phones, tablets, media devices, & other USB products. RoHS compliant DC Input: 5V/1A DC Output: 5v/1A FCC, CE certified. 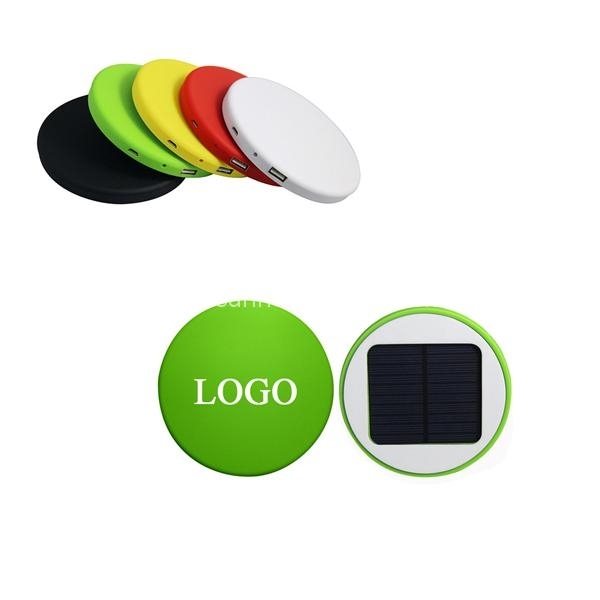 Round shape solar charger / power bank is made of ABS. It can be stick to windows. Assorted colors and custom logo can be imprinted. Other capacity is available. 9V Batteries . Price includes Full Color Imprint. 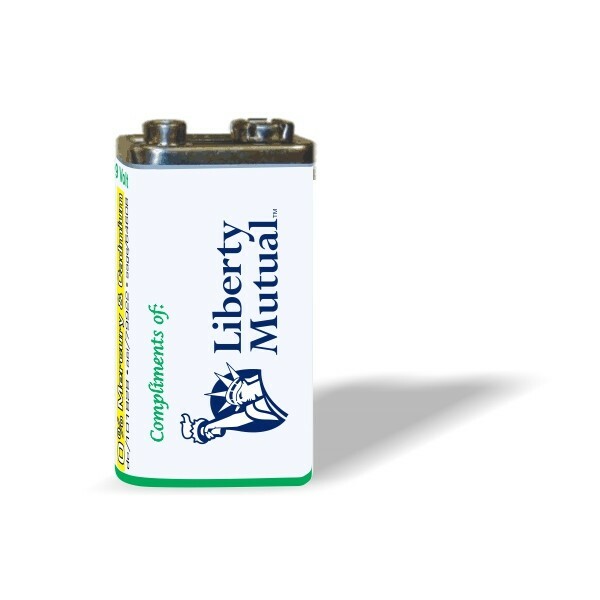 Batteries are suitable for everyday items such as Smoke Detectors flashlights, remotes, toys, radio, and more. NOTE: These batteries are good quality! They are NOT a cheap six-minute import. 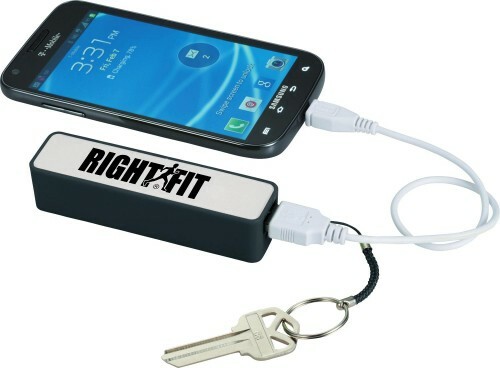 Fire Departments Mortgage Companies Real Estate Companies love handing out our batteries to keep their logo in sight. 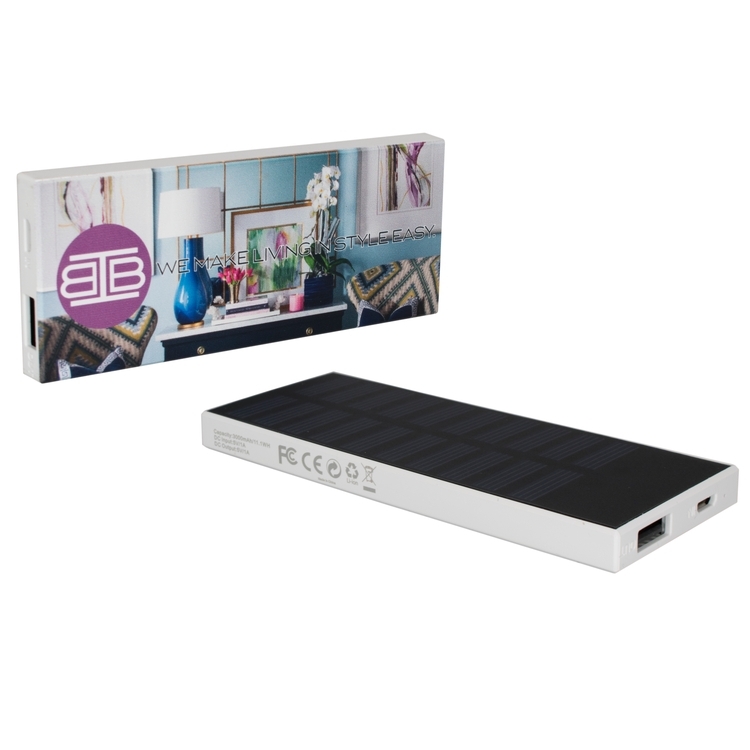 This chic and modern power bank features a high capacity USB input, which is practical for charging not just your phone, but Ipad, tablet, notebooks, and more! 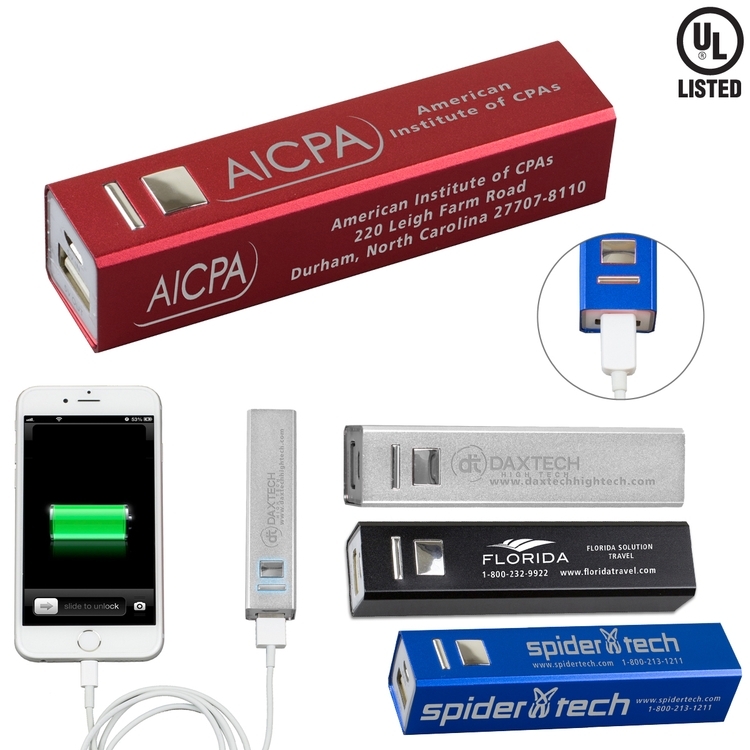 Compact yet practical, this power bank's imprint area will give your brand generous visibility. 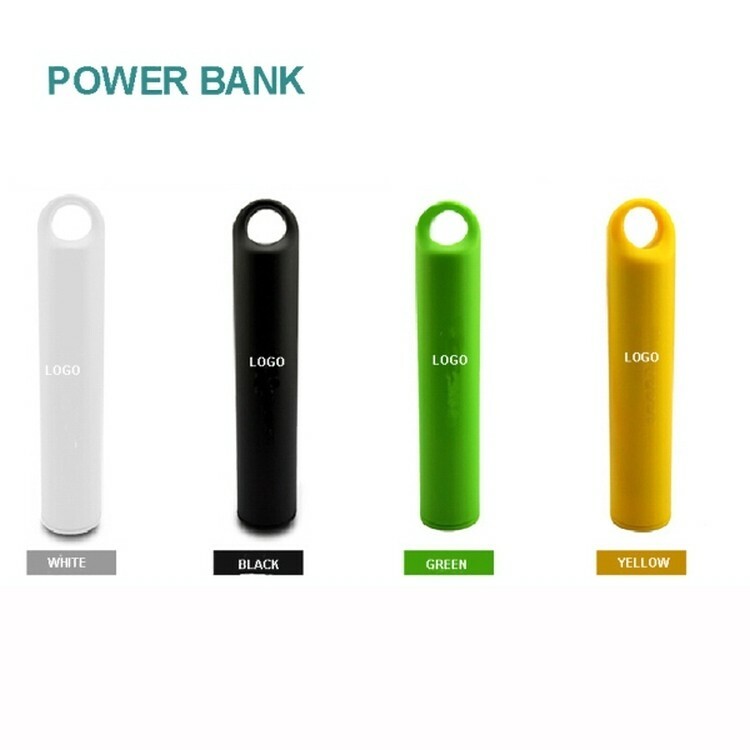 Cute Power Bank for Phone. The input power: 5 V 800MA - 1 A. Output power: 5 v1-1. 3 A. Board efficiency: 85%. 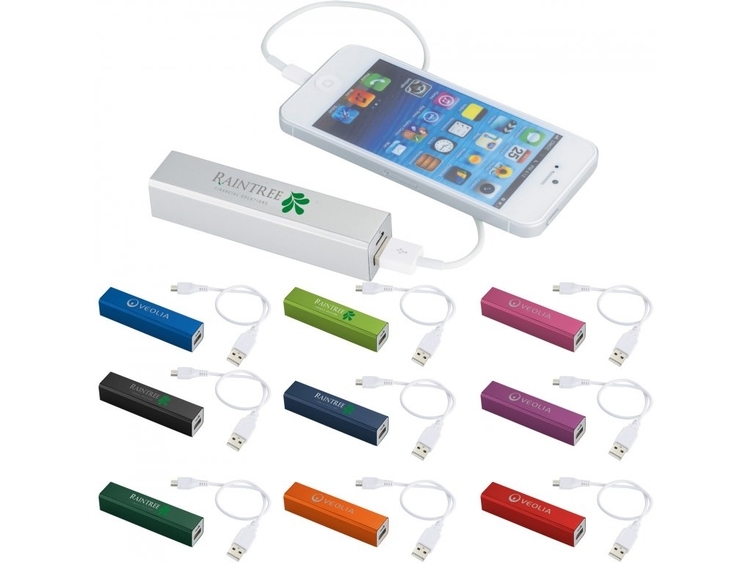 Battery type: A high capacity polymer batteries. Switch button: open automatically. The shell material:PVC. 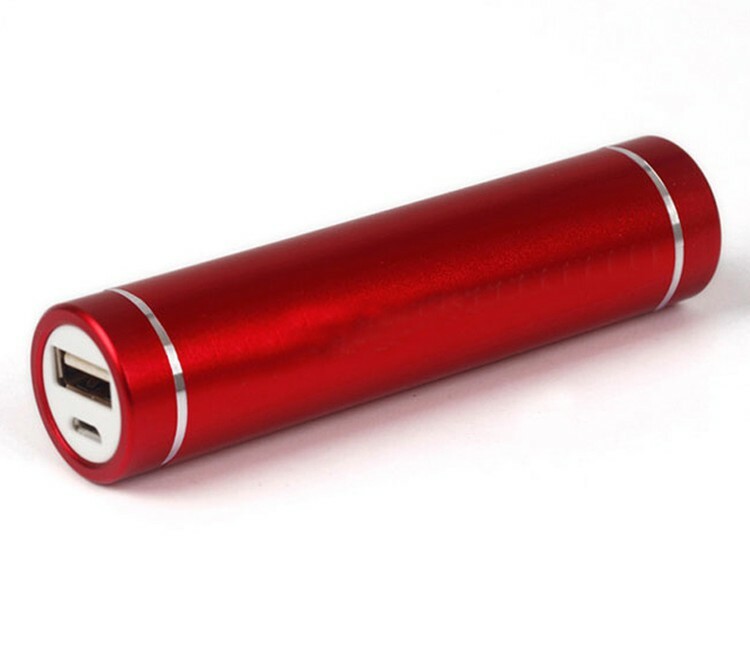 Output interface: a USB interface Capacity: 3000 mAh. 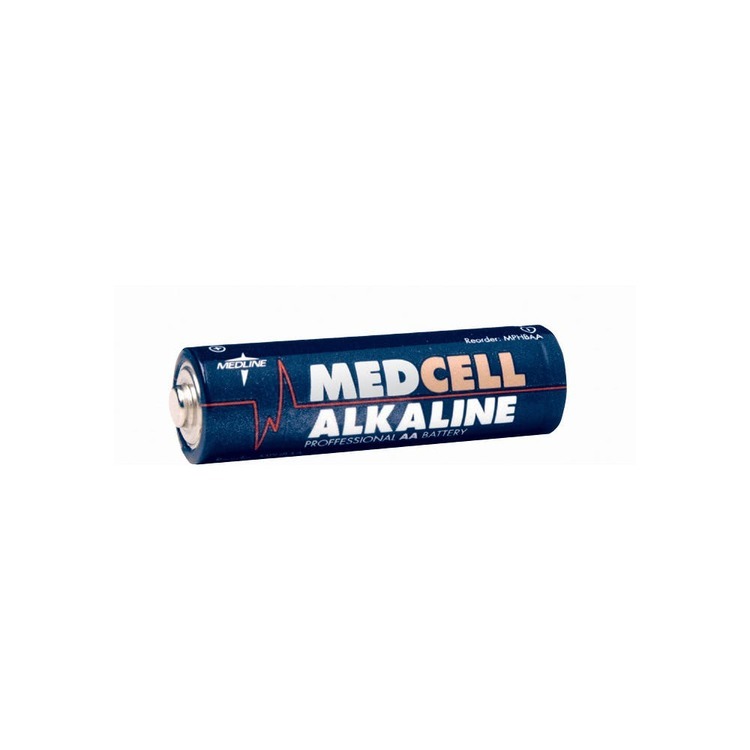 AAA Alkaline Battery 2 pack. 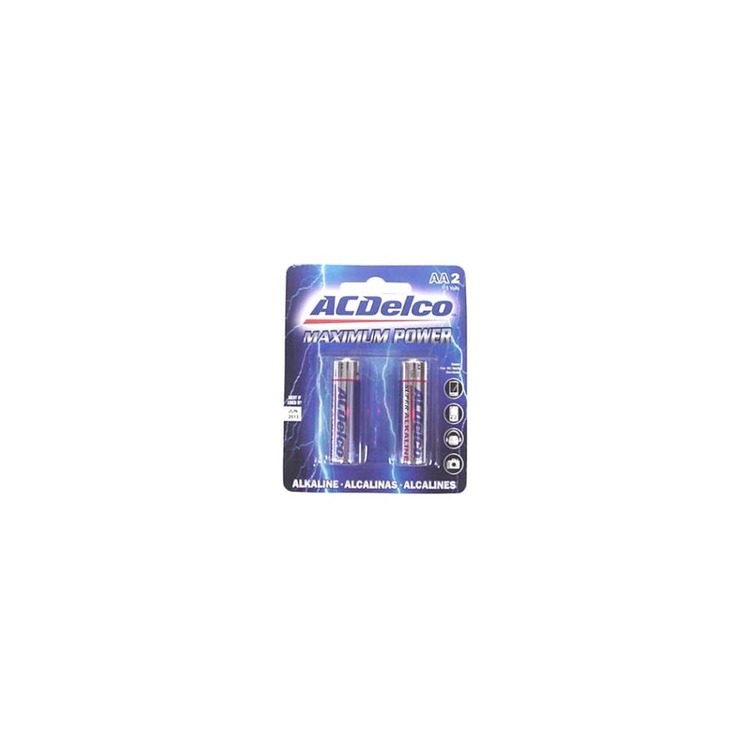 AC Delco extra long lasting. 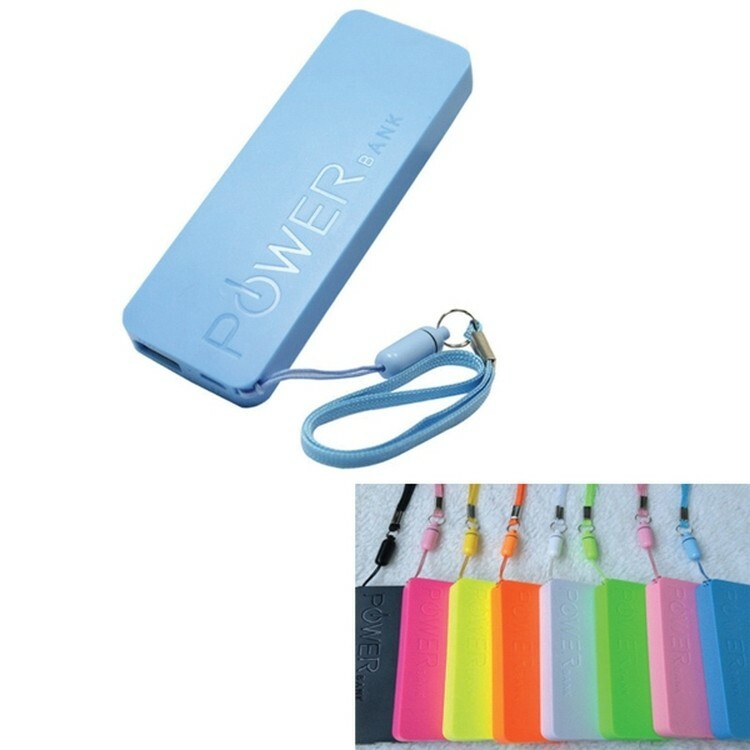 This 5600mah power band is absolutely safe. 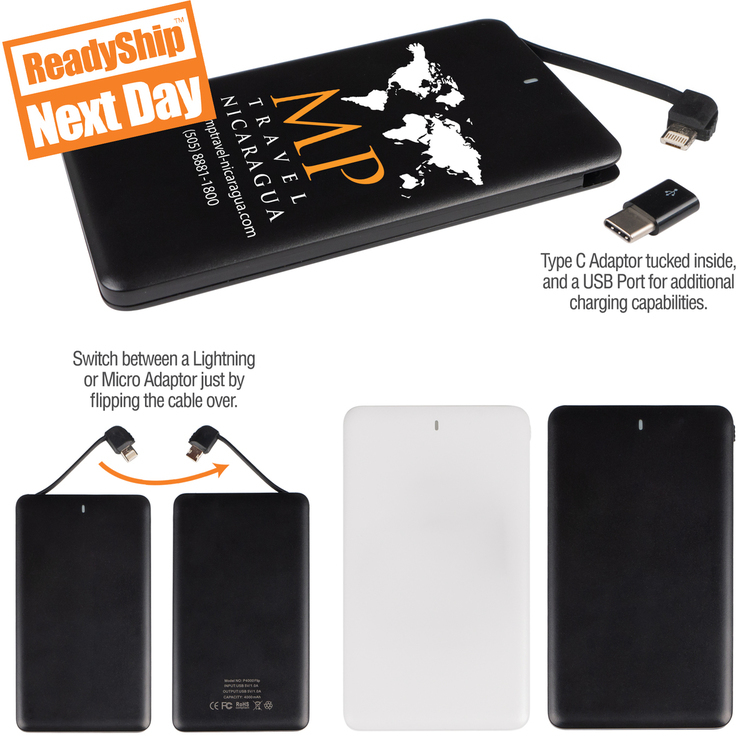 Easy to carry so you can charge your phone any place any time. It's life is very long, it can charge phones over 1000 times. 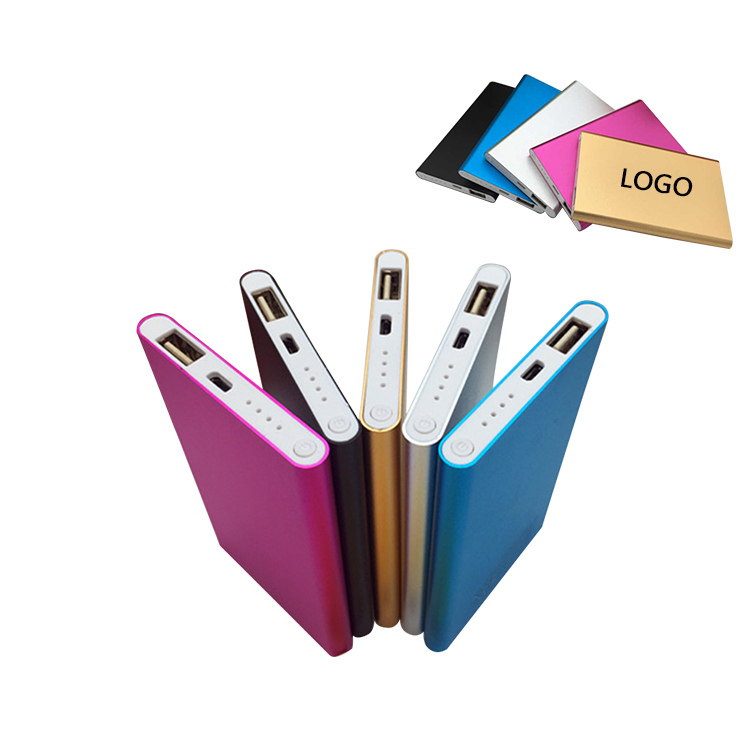 2200 mAh personal charger for smartphone and tablet devices. 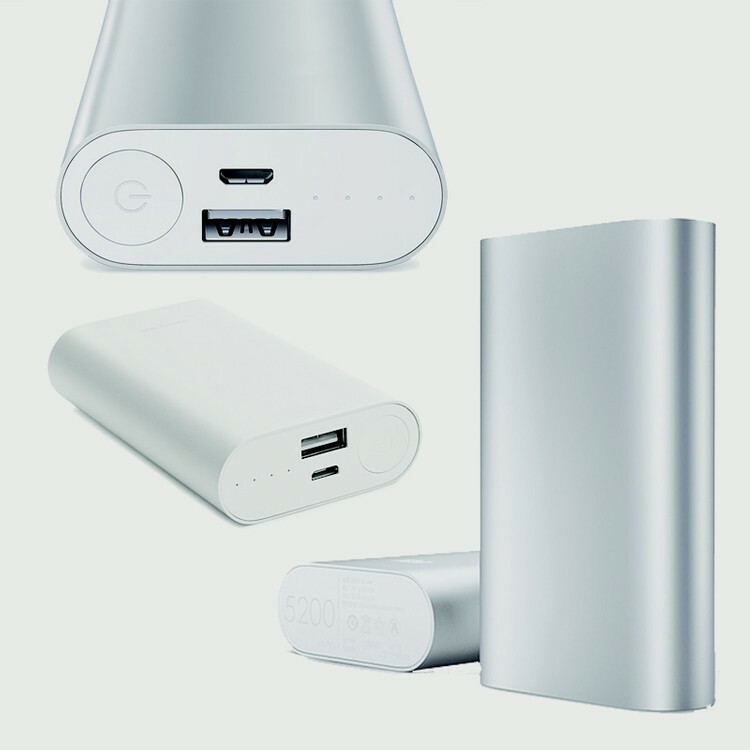 Charge your device on the go anywhere. UL certified with a plastic housing and arrives in an individual box. 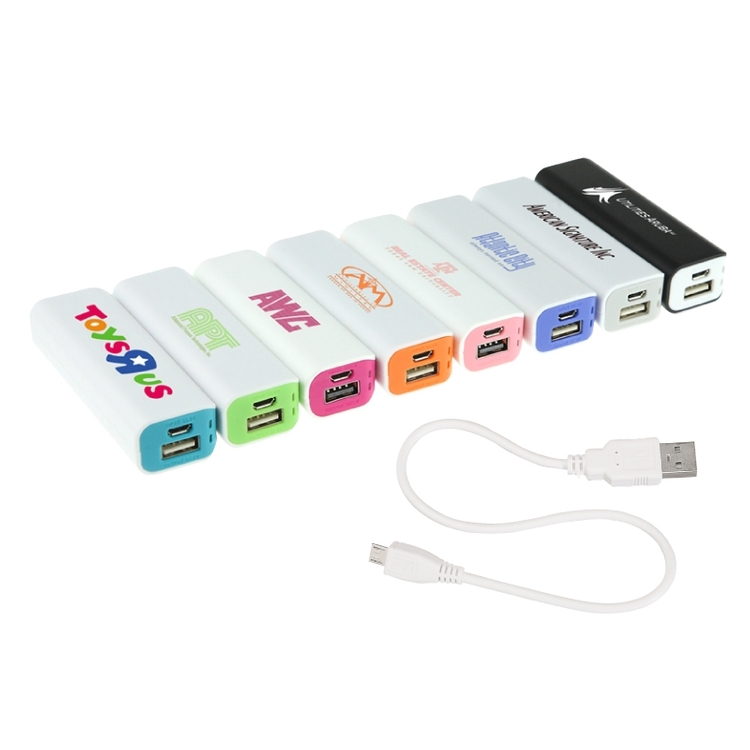 Connect any USB cable, or use the included Micro USB cable to recharge devices and the power bank itself. 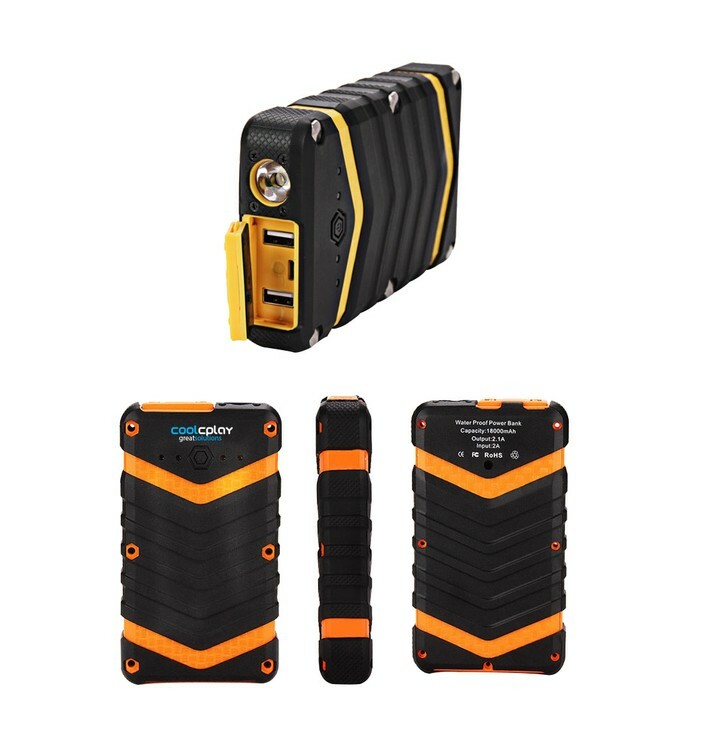 Lithium ion grade A non-recycled battery with auto on/off overcharging function. Outputs 5 Volts/1.0 Amp. 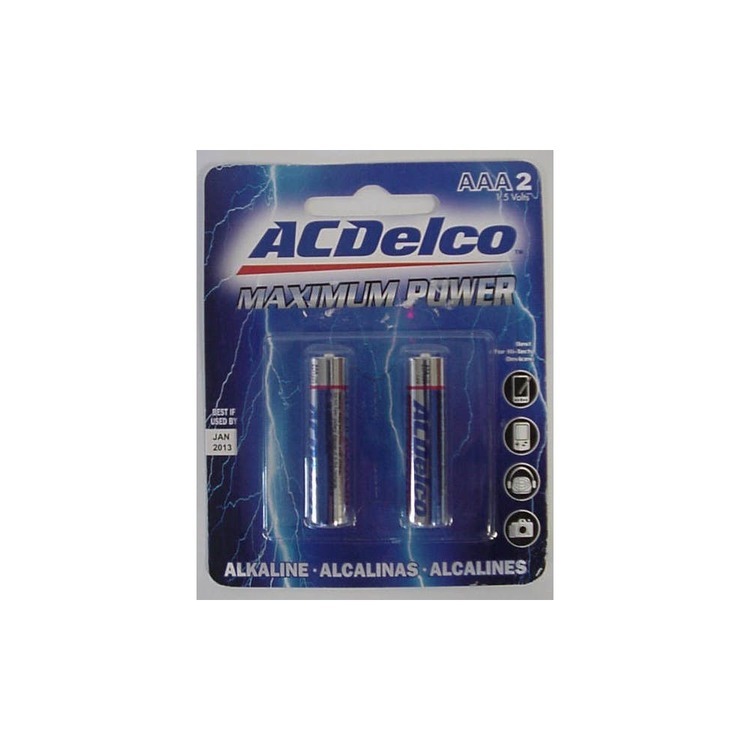 AA Alkaline Battery 2pk. 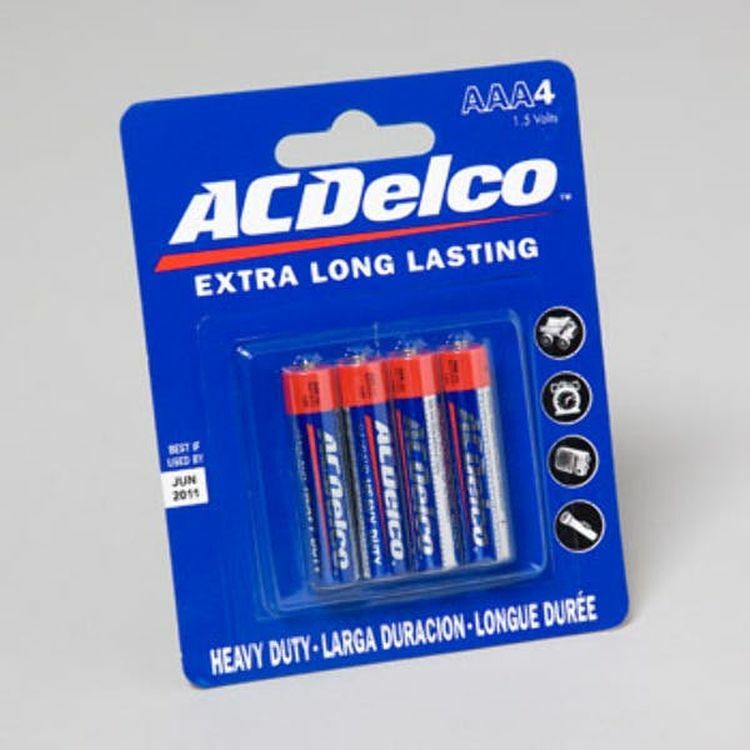 AC Delco extra long lasting. 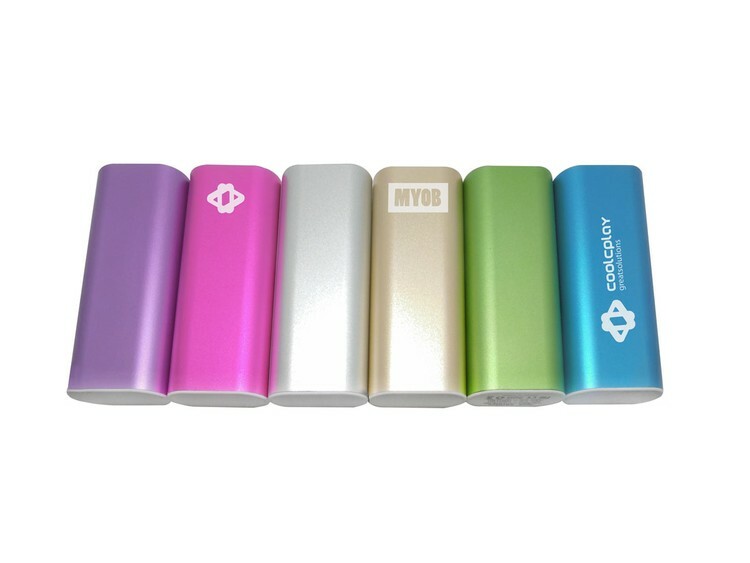 Mini Power Bank 2400mAh. Packaging with a rope and cable in the box. It's beautiful and portable to carry. We can make logo as per your request. This 4-in-1 recharging/syn cable combination can be customized to be compatible with most smart phones on the market. It folds to make a fashionable fish design which makes it a great giveaway for personal care and cosmetic events. We use silkscreen printing technique that makes the imprint part assuring a long lasting appearance. 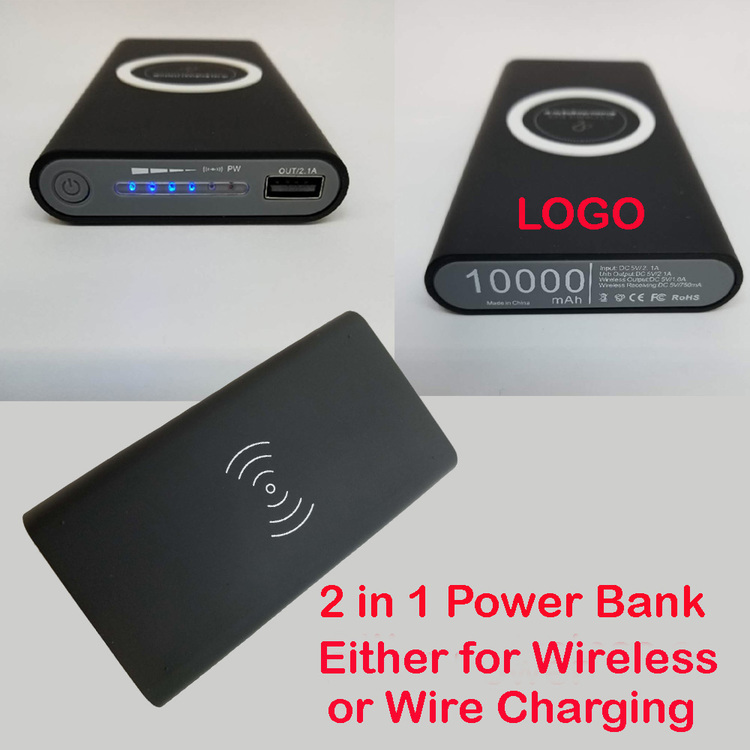 2 in 1 Wireless and Wired Smartphone Charge. 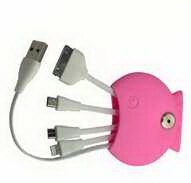 This product can be used as regular models of Iphone charger with wire and also used for any newest models of smartphone wireless charger. It is high efficiency, turbo speed and premium quality of newest device serving you on the go. Two colors available: black and white, please specify color when ordering. 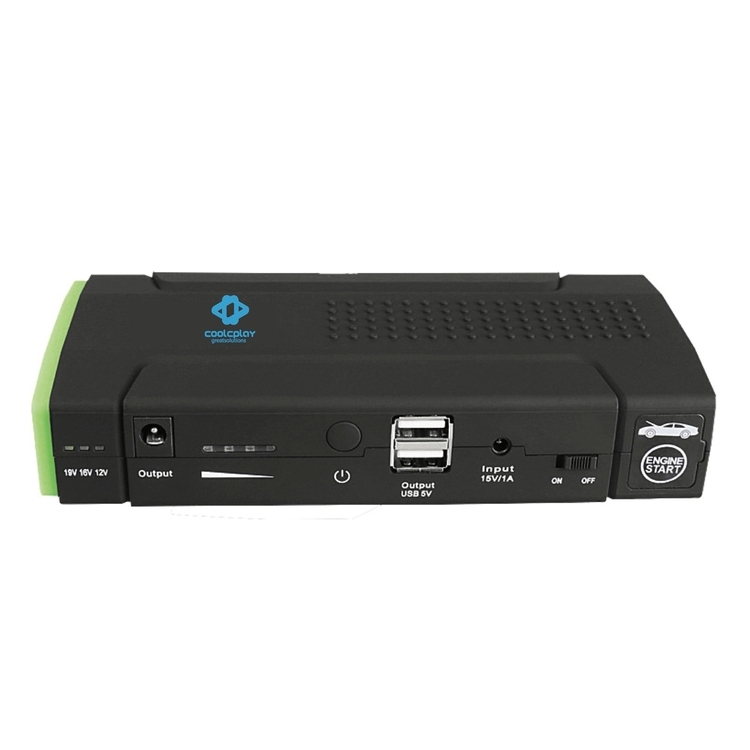 4 imprintable locations are available, upper part above the bottom , or lower part below the button on front side and also upper part above WIFI signal or lower part below signal on the fack side of device. Please specify where you prefer. 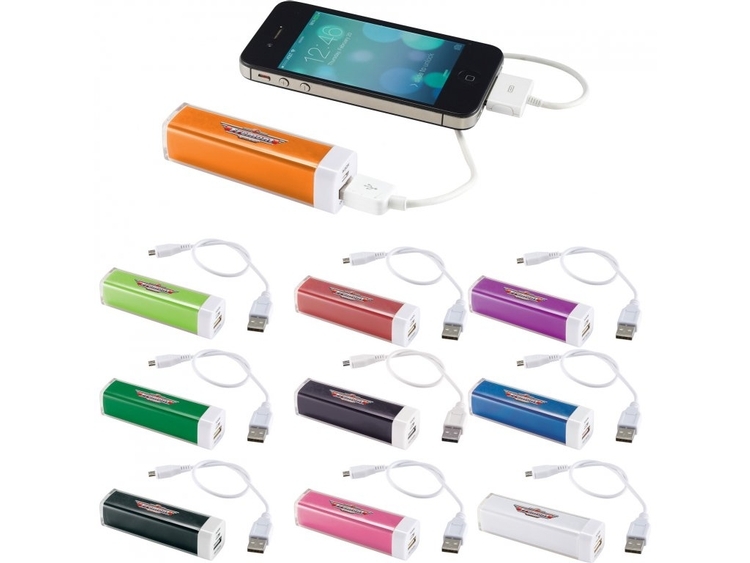 2000 mAh rechargeable lithium ion Grade A battery is enough to charge smartphones, MP3 players and more. 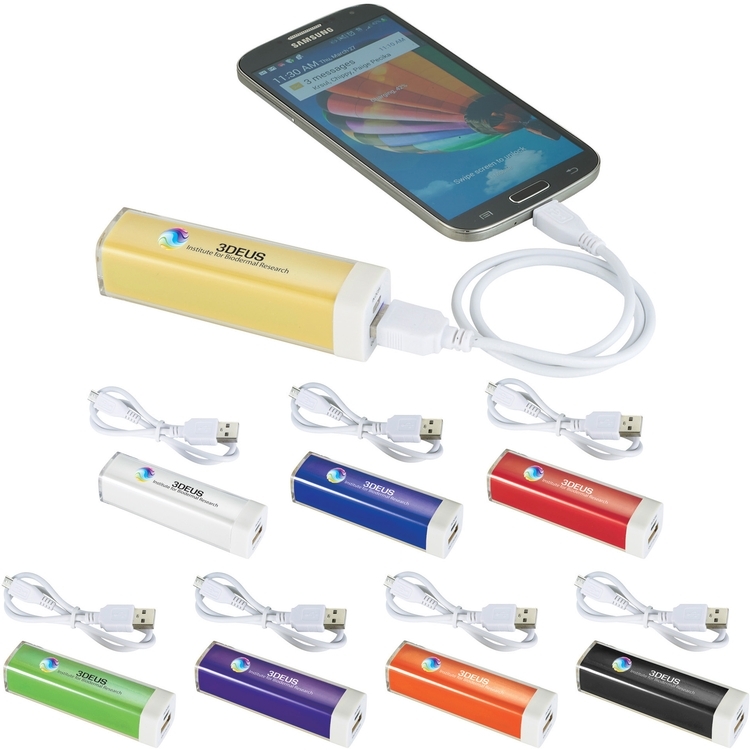 Reusable power bank charges via USB cable (included) which can be used to recharge the battery backup or to charge up devices with a Micro USB input such as Android smartphones (Samsung®, Motorola®, HTC®, Nokia®, and others). Red LED light indicates while charging. Includes split metal key ring. Input: 5V/500mA. Output: 5V/1000mA. Media device not included.